Original Release: 1968, Universal Pictures/Toho Co., Ltd. I have many geeky interests but in regards to the likes of King Kong and Godzilla, it’s always been a passing interest. I have not seen all of the Toho monster films and while I’ve seen the original 1933 King Kong (and just recently King Kong vs. Godzilla), I don’t profess any great love or knowledge of the character or the various King Kong remakes that have happened over the years. I’ve never even had an interest in watching the Peter Jackson version of King Kong. I typically rent movies either via the public library or Netflix but I bought this one. Why? Well, the truth is I forgot the DVD was available through Netflix (it was even in my queue), so I ended up ordering the Blu-ray version through Amazon for $9.96. That’s okay though because I then remembered that Toho had teamed up with none other than Rankin/Bass Productions in the making of this movie. Yep! The same company that brought us countless classic holiday specials featuring Rudolph, Santa and Frosty also had a hand in producing a Japanese monster movie with the studio that created Godzilla. Oh! By the way, one interesting and annoying thing about this release is that is has no menu screen! If you pop this disc in, you’re done. You better have your popcorn popped, have already gone to the bathroom and be ready to watch the movie. That is, unless you’re willing to sit through all of the copyright and legal notices so that you can pause the movie and then go do whatever else you have to do. It’s 2014. Who sets up a movie disc like this? I could understand maybe if this was a cheap public domain release but this was released through Universal so I would’ve thought they’d do a better job by giving us a start menu and at least a theatrical trailer. Let’s go back to Toho for a minute. Immediately after the success of King Kong vs. Godzilla, Toho wanted to do another King Kong vs. Godzilla movie and build an entire series around Kong except they couldn’t secure the rights from RKO Pictures to do so. A few years go by and by this point Rankin/Bass had licensed the character for a King Kong cartoon that aired on ABC from 1966-1969. Rankin/Bass and Toho decided to work together to produce a new Kong movie that would be loosely based on the cartoon (though this movie is pretty violent at times) and also take inspiration from the original 1933 King Kong film. 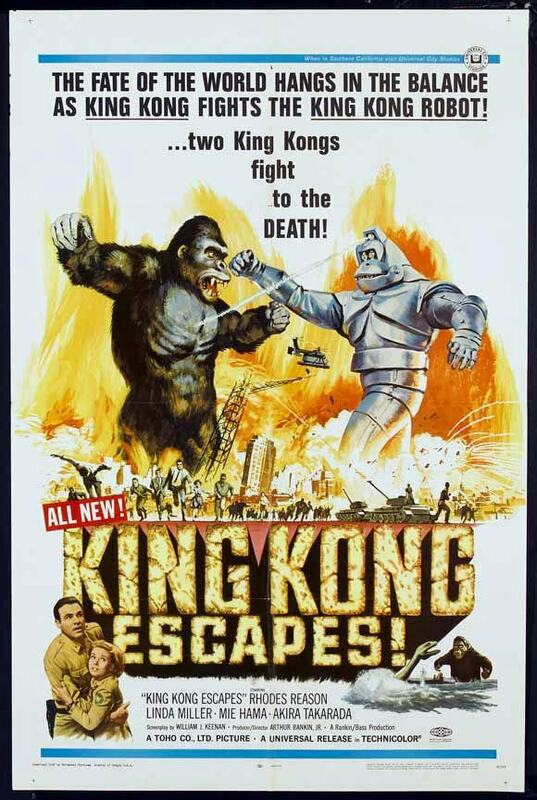 All you have to do is look at King Kong and his robotic counterpart Mechani-Kong to see the Rankin/Bass influence. Mechani-Kong is pretty cartoony-looking and King Kong reminds me a lot of Bumble from Rudolph the Red-Nosed Reindeer. 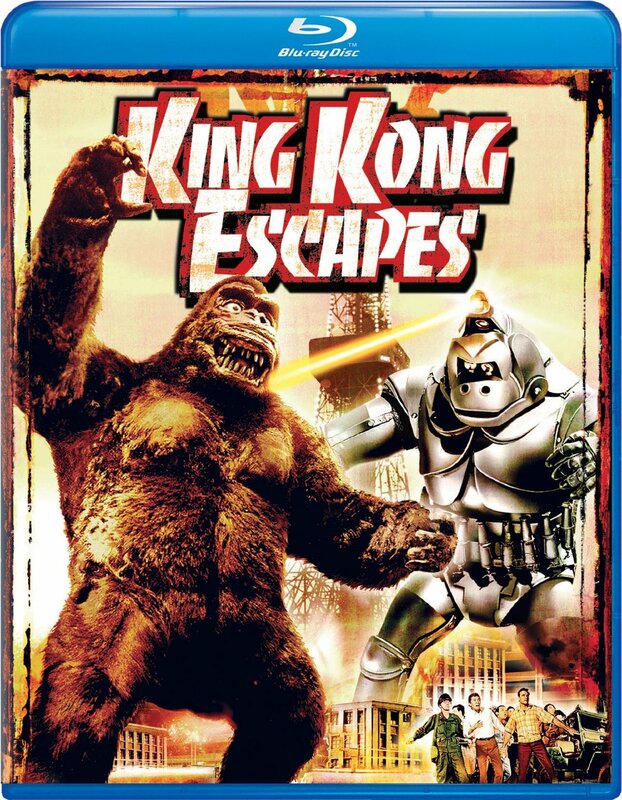 Having King Kong battle Godzilla is a greatly insane and insanely great idea but I prefer King Kong Escapes. Both movies are pretty ridiculous but this one held my attention. King Kong vs. Godzilla is a bad movie. The fight scenes are fun to watch but overall, it’s not good. King Kong Escapes fares better as it really does have that Saturday morning cartoon feel to it. Sure, the evil Dr. Who (not the Doctor Who) shoots a woman to death, but his whole deal is so silly that the plot really does belong on Saturday mornings. After the release of this movie, Toho had plans to incorporate King Kong into 1968’s Destroy All Monsters but their license was about the expire so they did not. They did end up using Gorosaurus in that movie though (that’s the dinosaur on the Japanese poster). In the early ’90s, Toho briefly considered using Mechani-Kong to battle Godzilla but, again, licensing issues prevented that. It’s a shame, too, because the two Toho King Kong movies are interesting. You can put Kong in more situations than you can with Godzilla, I think. Godzilla is so slow and immobile. He basically just shuffles along waiting to smack something with his tail or unleash his atomic breath on but Kong can run, jump, climb and swing his fists (but sorry, no electricity-based powers for this version of Kong). For the Rankin/Bass connection, this movie was worth $10 to me. For anyone else who is a monster movie fan, this is worth a look.